In case you hadn't heard, I'm snowed in. Georgia received a ton of snow/ice earlier in the week and we are taking our sweet time digging our way out. Lots of impassable roads, parking lots that look like ice skating rinks, cars ending up in ditches, etc. We've done all the work we can do on our master bathroom up until the plumber comes (hopefully TODAY if he can slide his way here!!!). I used up the only two gallons of paint I had left in the house (more on that later!). I stalked visited all of my favorite blogs. And read each and every one of my work emails. Oh, and I ate about forty-two bowls of chili. So what else is a girl to do?! Gussy up one of the walls in my office. With the help of a magazine/mail holder from Ikea and a little switcharoo action with some of my favorite fun art from around the house (the Georgia print is from Jenna, the "I love you" print from Jen, and the photo of me and David was taken by my cousin, Kendall), I added some depth to this wall of my office. Like my giant calendar/inspiration board? Here's the tutorial on it. And our stripes? Learn how to get those here. And just for the full effect, here are a few more shots of the ol' office. it looks fabulous!!! we are in the process of getting drwall in our family room, and i am creating an office area for myself... it won't be this pretty or organized, but i am aiming high! your office is an inspiration! Wow! I just want to go sit in your office and admire how beautiful it is. I love the colors. I love how your bookshelf is color coded. I love it all! Looks fabulously organized! 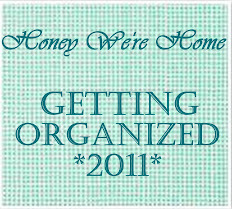 Nothing like being snowed in to get the house organized! I love your office - so pretty. Beautiful office, love that Georgia print. I LOVE your office! Everything is just beautiful! Love it, looks amazing as does everything you do! Love your blog and office space! We just painted horizontal stripes on our playroom and I love that we can use it as a family space too. I think horizontal stripes rock! I just started blogging too and would love any advice!! Great site! love it, I love the new pictures and that inspiration/calendar board is too cool! I hope the plumber makes it today! Michelle, this looks amazing! I love the calendar!! Your house is simply amazing!! Looks great! Calendar is a great idea! Love love love the calendar! What a great idea! Love it, girl! Such great additions. I wish we'd had more snow here in Texas, we just had little flurries. Although, I guess I'm glad we're not still stuck inside. you have one of my favorite offices! And that calendar is awesome!! looks good...and so efficient...I think I need to convert an area for something like this! I am so over this snow and ice!! I love the bulletin board. That is awesome!! Here's hoping we thaw out soon. It looks great! I love those 3 prints together. And you have 2 of my favorite magazines in that great ikea holder! love, love, love everything about your office! Wow! What organization! Love the sticky note calendar, too! I love the walls! I would love to do this in our spare room! Love the pops of color you put on the wall - the frame colors are great! You've inspired me to play around with color when spray painting old frames. I just blogged about my recent gallery wall, too...I'd love if you'd check it out! So pretty!! Love the stripes and cool calender. Just popping over from The Inspired Room. It is great to see your gallery wall. Mine is #10. Gorgeous! The stripes are fabulous, the desk is awesome, I'm running out of adjectives!! thanks for sharing.